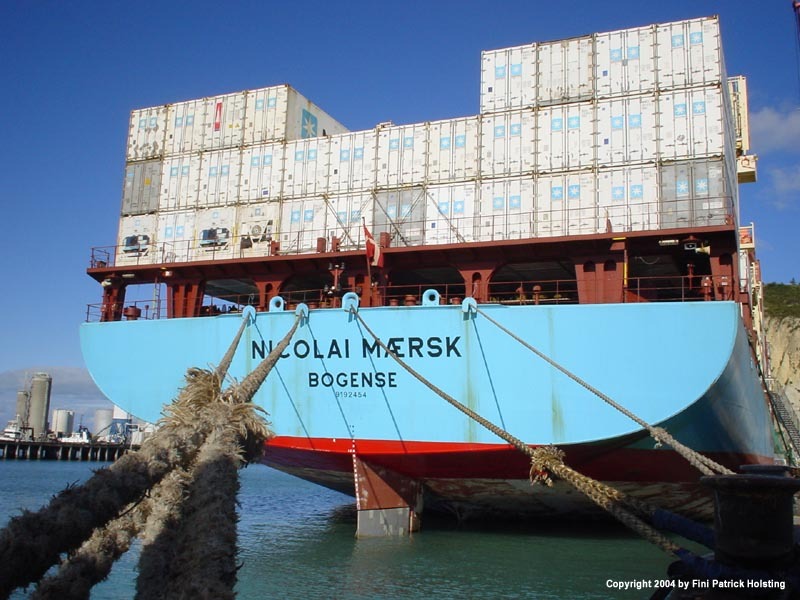 The ship's port of registry "Bogense" is in Denmark. 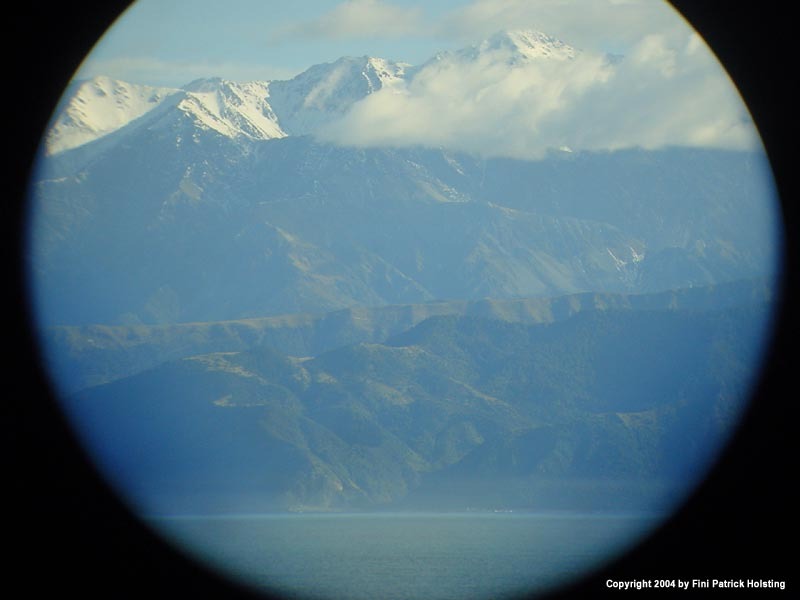 Time to go ashore in Napier! 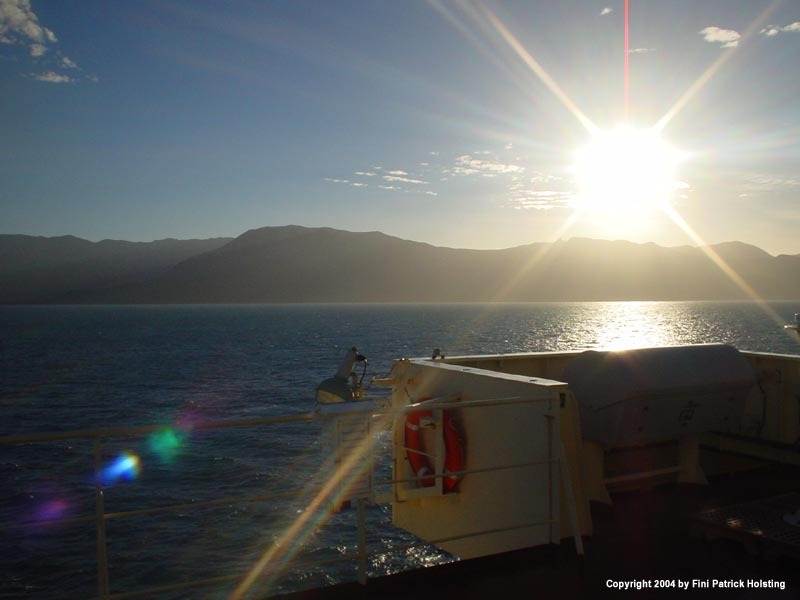 This pictures was taken just outside the gate to the port. 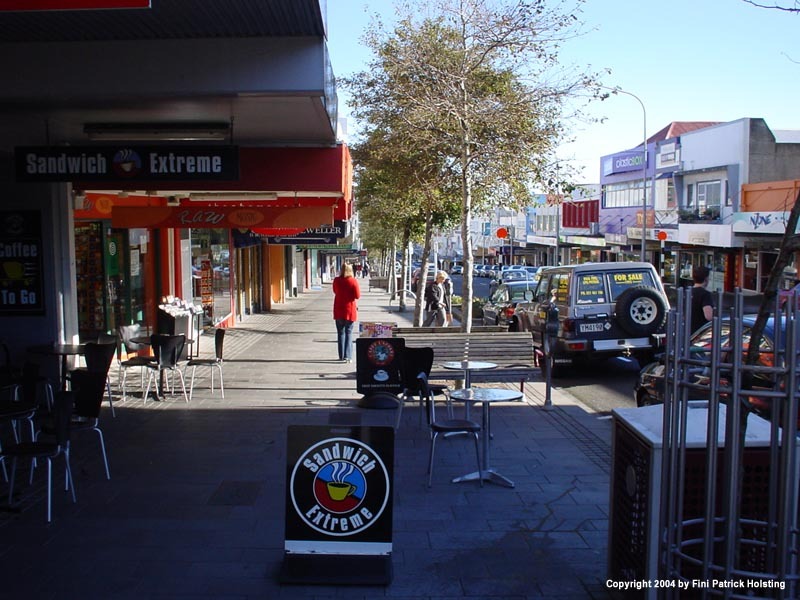 Down town Napier. In my oppinion, a very cozy little town with charming streets and houses. 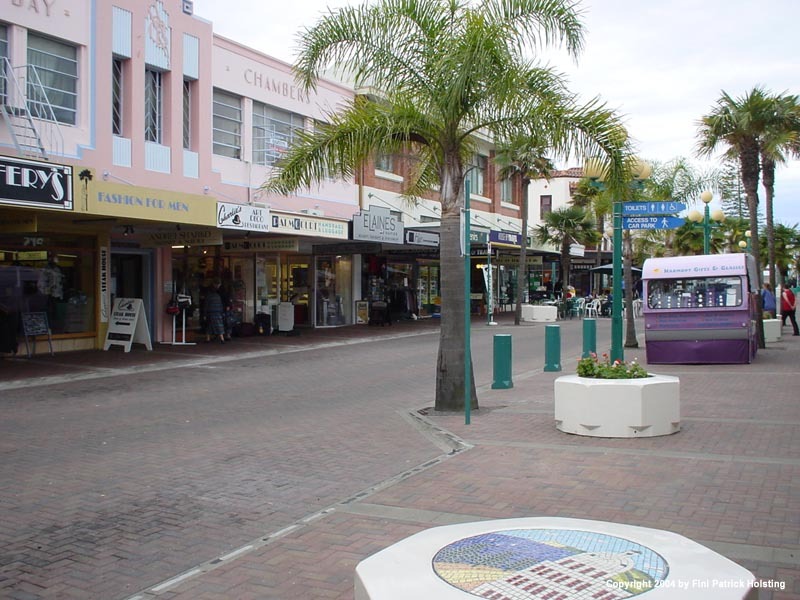 I went ashore with two other crew members, and we spent most of the day in the town, having lunch, exploring the town and even went to the movies. 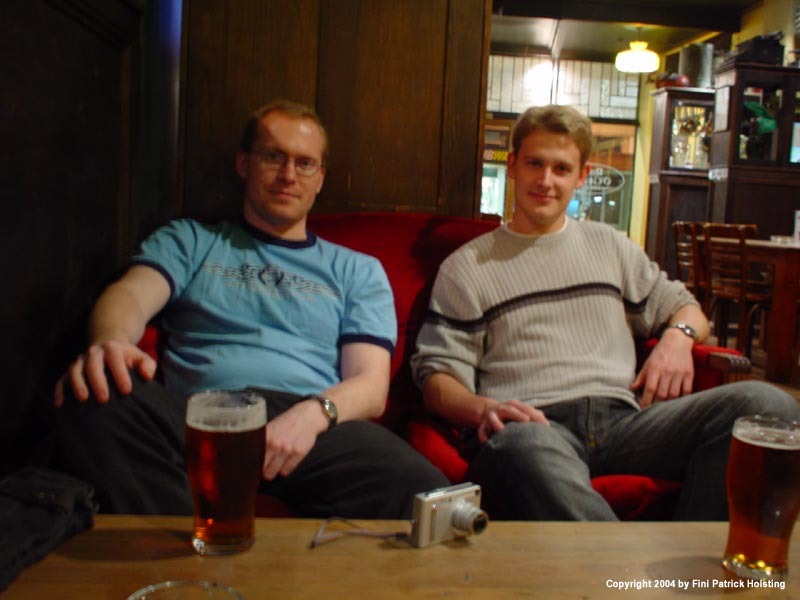 A relaxed atmosphere in a Bar in Napier, chief officer Brian sitting to my left. 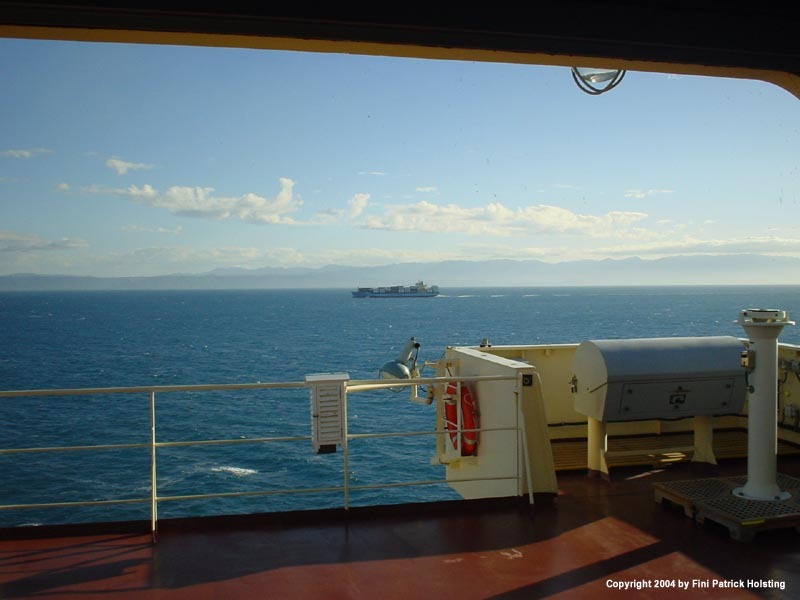 A look from my cabin, as another ship overtakes us at close range. 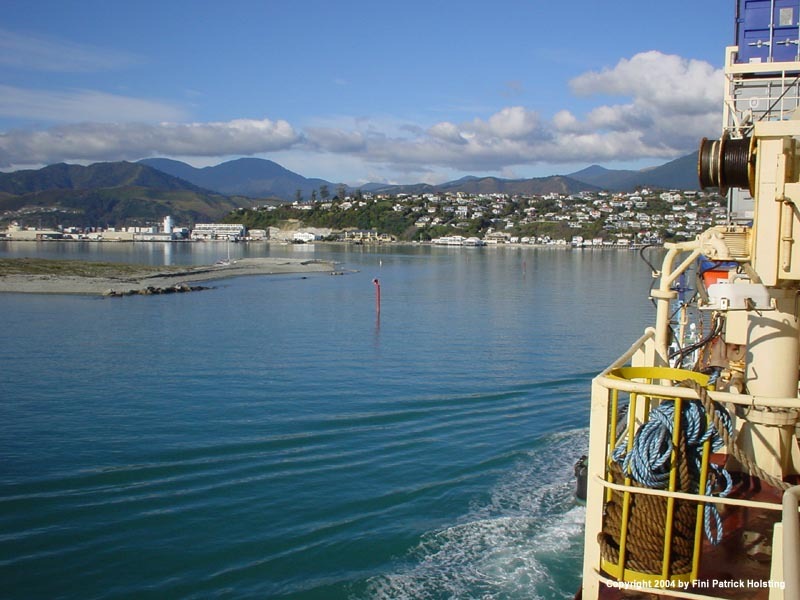 Entering the port of Nelson, New Zealand. A beautiful, white Lauritzen Cool ship berthed in Nelson. The air was very clean, crisp and cool, which is somewhat evident in the photo. Magnificent nature! 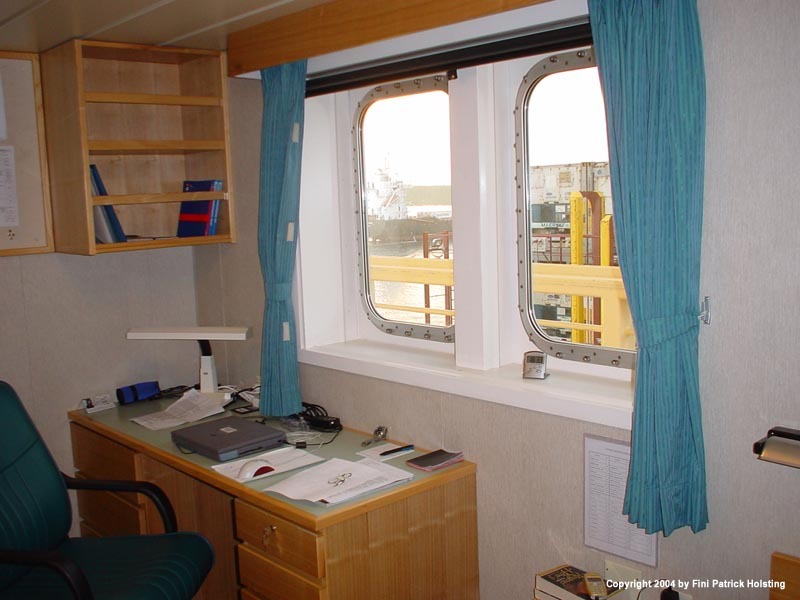 A look at the cargo deck aft of the accommodation while berthed in Nelson. As you might have noticed most of the containers are reefers. 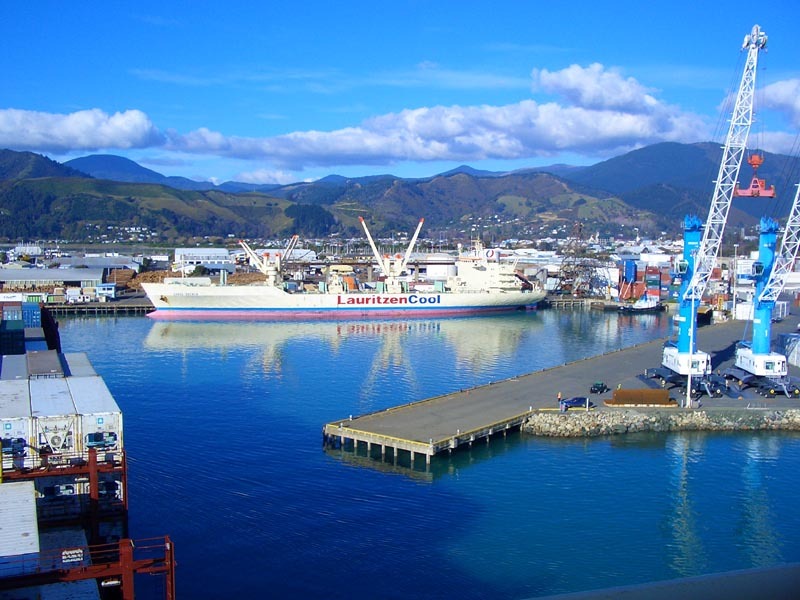 New Zealand export a lot of refrigerated or frozen goods, so often most of the cargo is reefers. Here I'm overlooking Port Nelson. 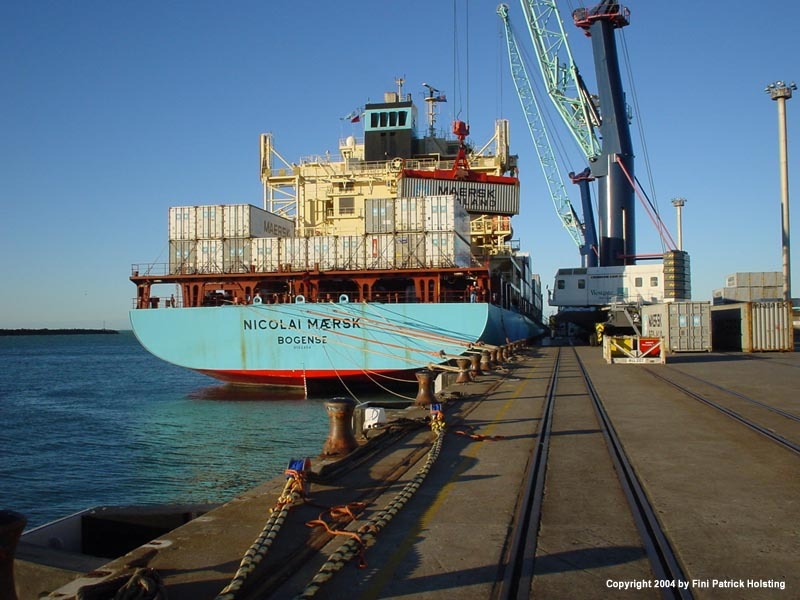 A creative mooring arrangement in Port Nelson, which was necessary since the pier was too short for the Nicolai Maersk. The south coast of the northern island of New Zealand. A beautiful, mountainous landscape. Spanning from snow-covered mountain tops to lush green grass, this was really a pretty sight. 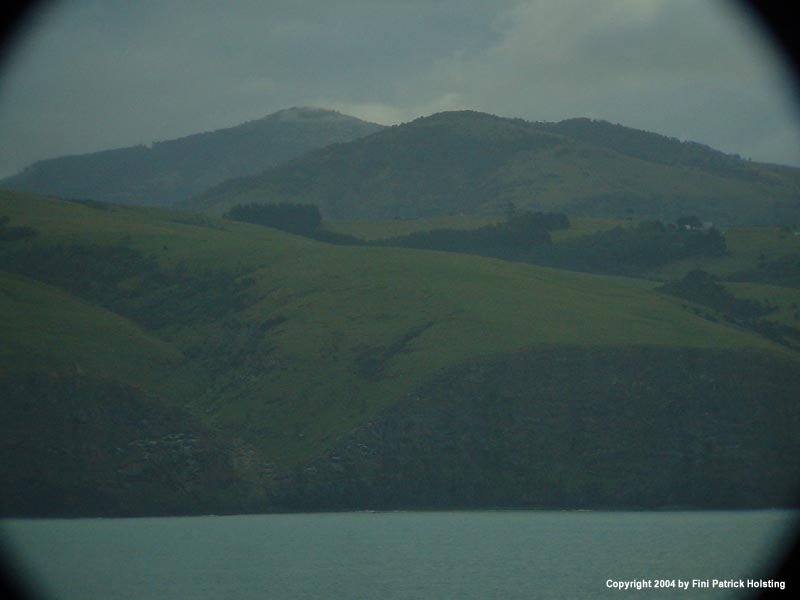 Agriculture is a very important industry in New Zealand, especially sheep farms. Watching these sloping hills of grass, you can understand why. 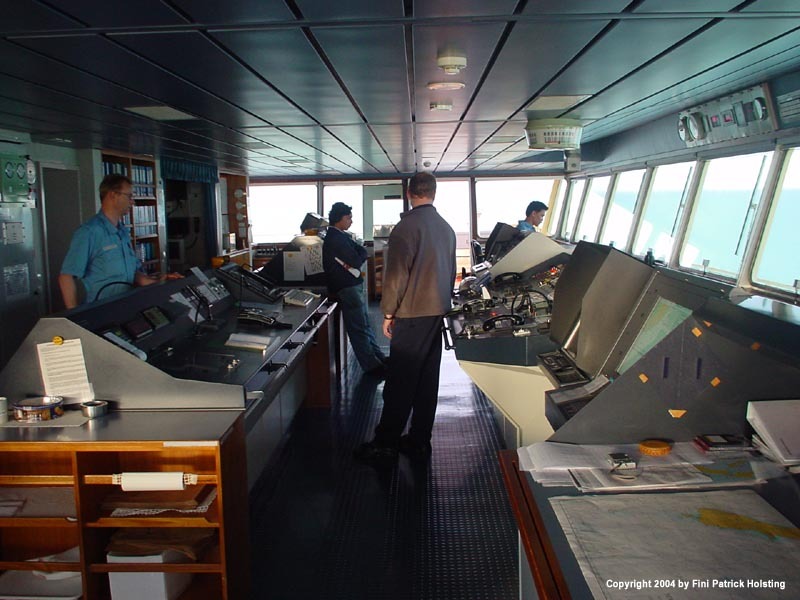 An unusually crowded bridge on a relaxed day at sea in between busy port stays. On the left is Chief Engineer Jan and between the consoles is Chief Officer Brian. In the background the two Electricians are taking a break from their weekly check. I had the pleasure of sailing with the one on the right years later on Lexa Maersk. 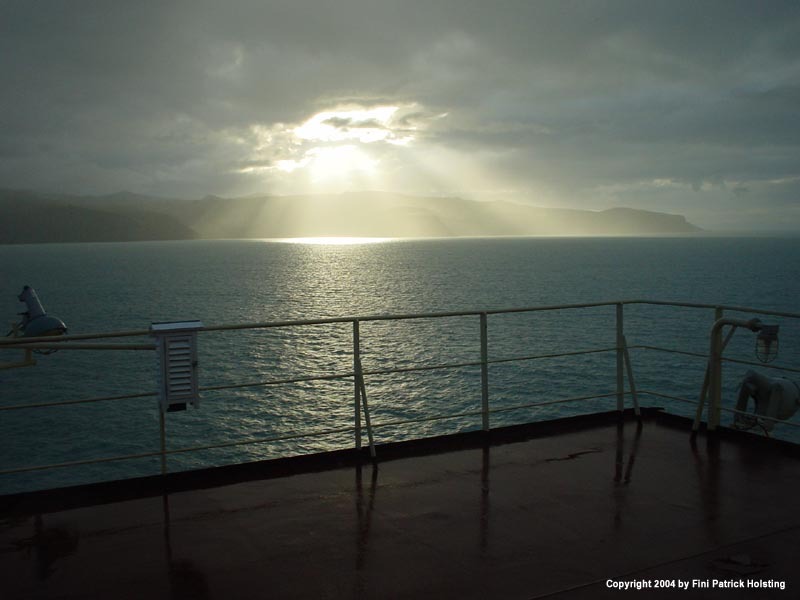 A divine sight, the sun peering through a small opening in the cloud cover as we head north towards New Plymouth, our last stop in New Zealand this time around. 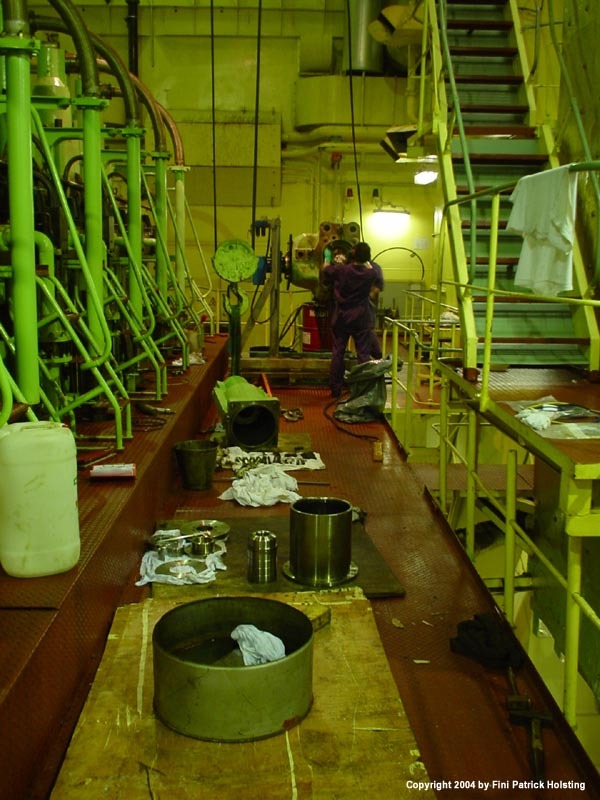 A view of the wheelhouse as it looks during the night watch. 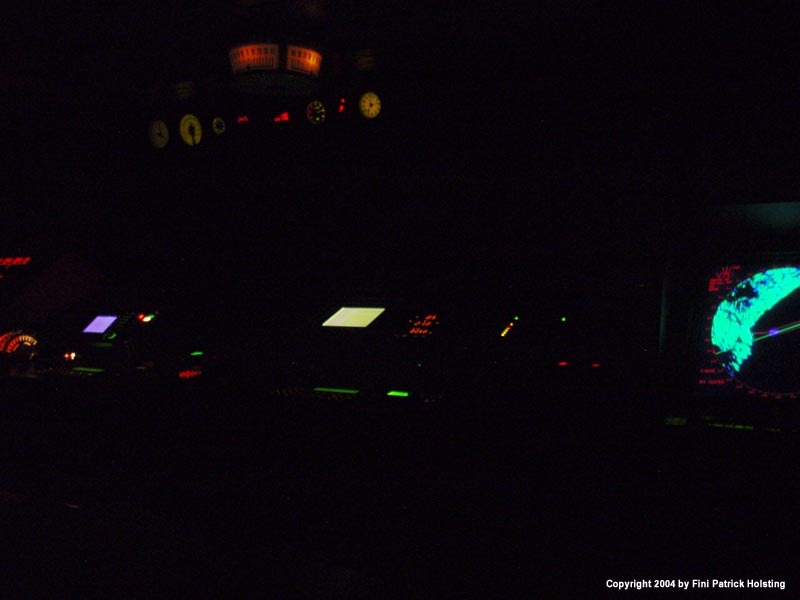 It's a very special atmosphere with all the colored lights of the instruments, shining stars and vast, black ocean. The Captain and the pilot manouvering the ship into position in New Plymouth on the north island. In the background is Mount Taranaki, it's changing snow cover always a good indication of the time of year. Here it's July, so almost the middle of winter. Chief Officer Brian making his way down the gangway on his way ashore in New Plymouth. 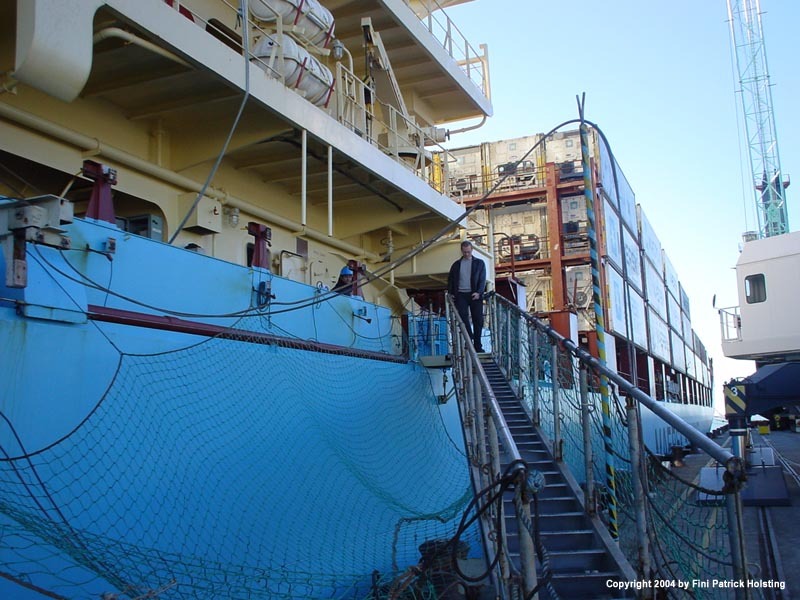 The Able Seamen rig the gangway just after arrival. They are quite good at it, so it doesn't take them very long. 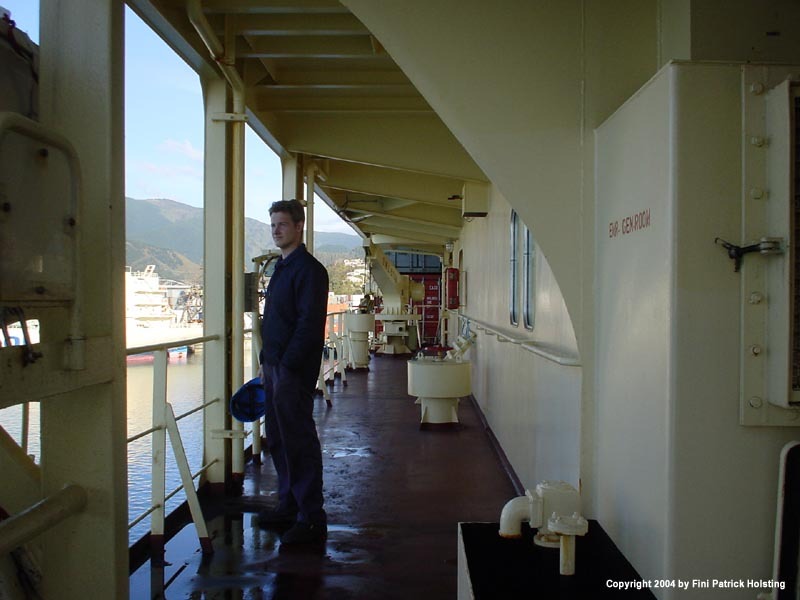 First people up the gangway are always customs and emigration authorities, often accompanied by the ship's agent. Safely moored in New Plymouth. 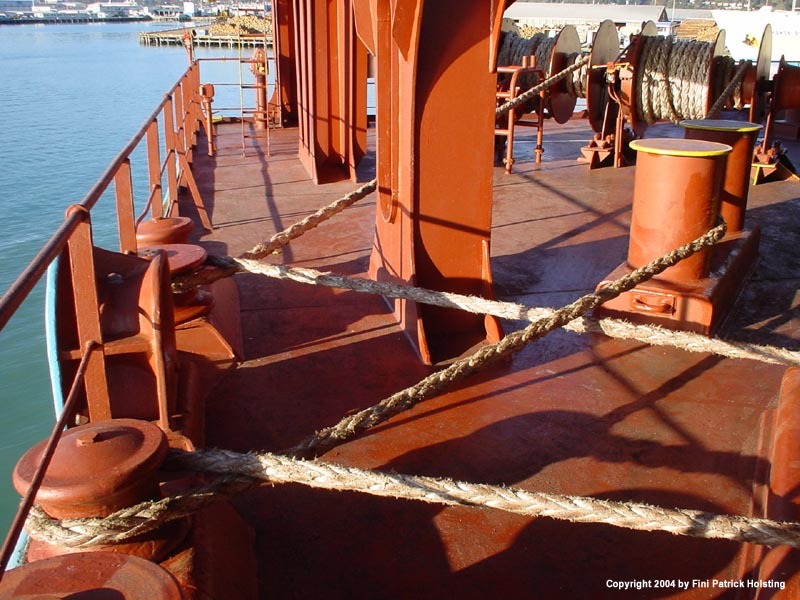 The mooring arrangement is quite special here, a combination of the ship's lines and strong, elastic fibre ropes from shore. This is necessary because of the swell coming in from the open Pacific Ocean just outside the breakwater, which makes the ship move quite a bit when alongside. 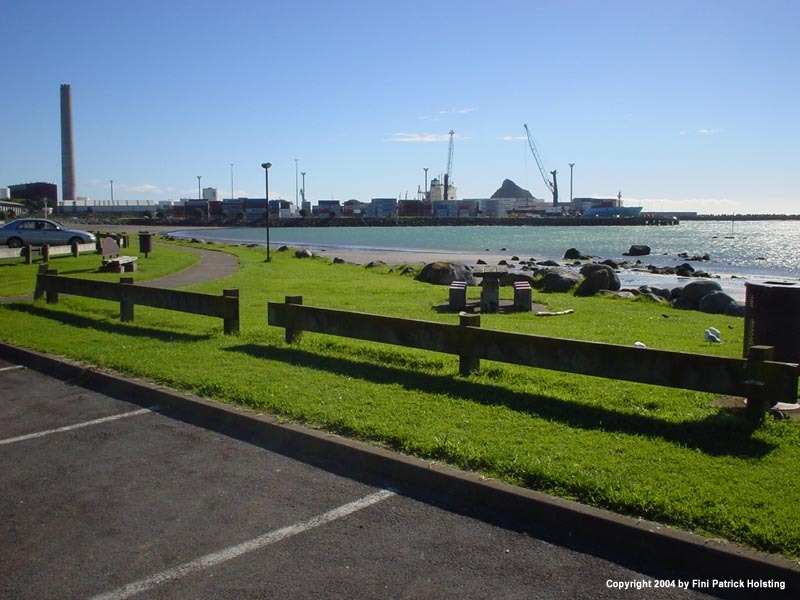 Going ashore in New Plymouth, I took this picture looking back at the port and the ship. 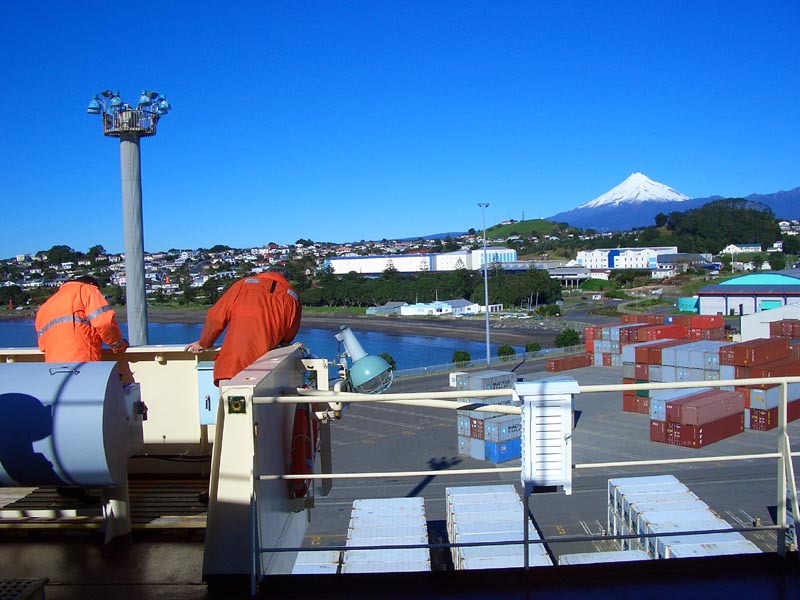 Leaving New Plymouth is one of the shortest manouvers possible, because as soon as you've passed the breakwater, your steaming directly into the vast South Pacific Ocean. 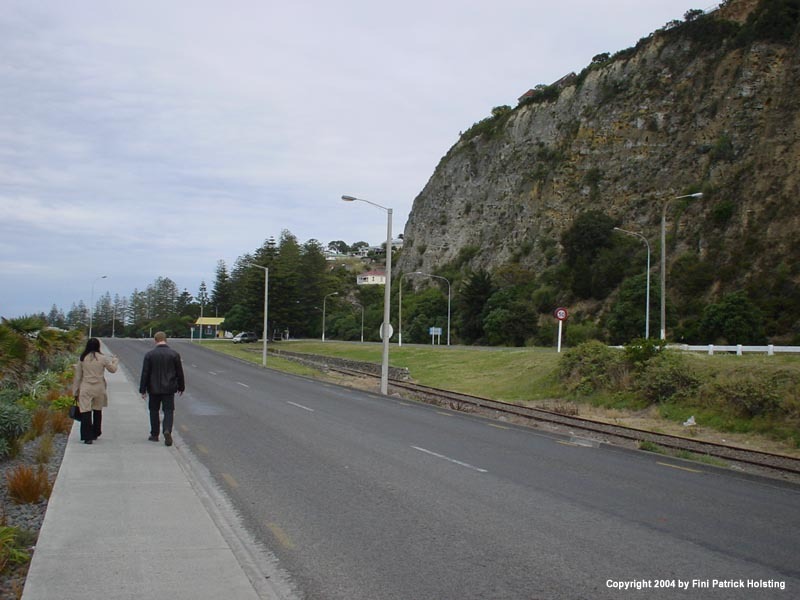 Downtown New Plymouth, a cozy town set in hilly scenery. I took a good look around the town and also found time to visit a restaurant and an Internet caf�. This was always a welcome opportunity, since back then there was no Internet on the ships, only email. 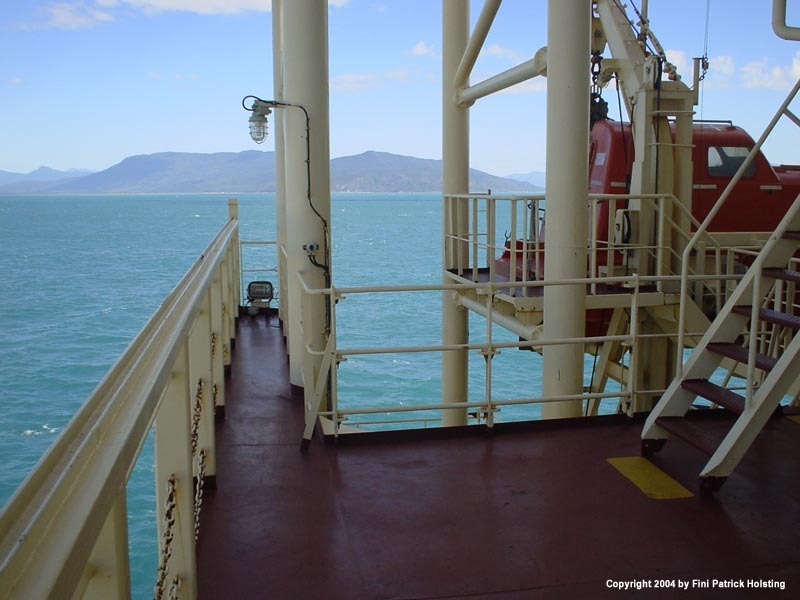 Transitting the Torres Strait northbound towards Tanjung Pelepas, Malaysia. In the background the rocky north east coast of Australia. 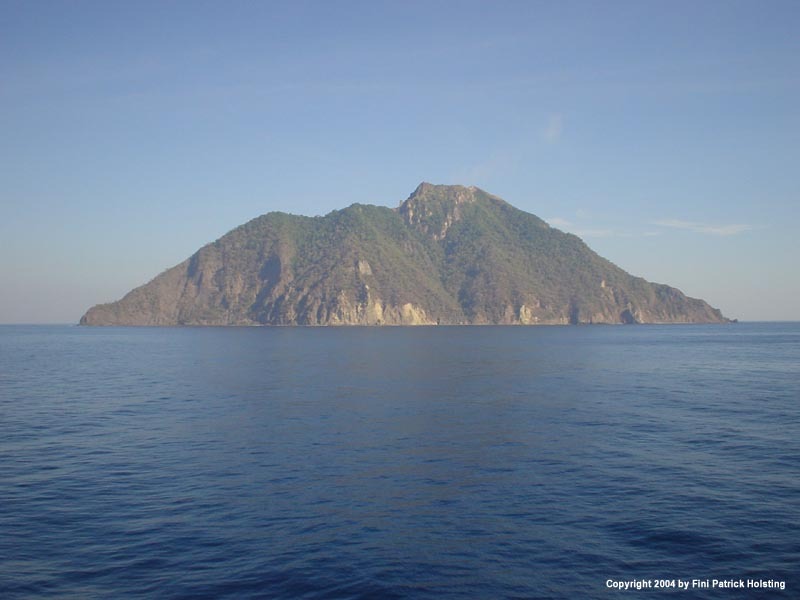 One of numerous islands in the strait between Australia and Papua New Guinea. 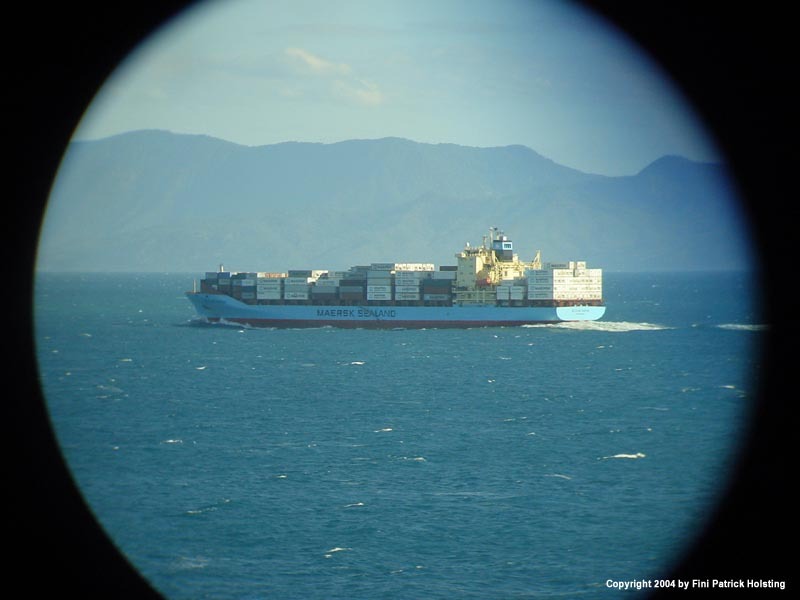 One of three sister vessels to the Nicolai Maersk, here the Nicoline Maersk, as seen through a pair of binoculars off the coast of Australia on our way back to Malaysia. 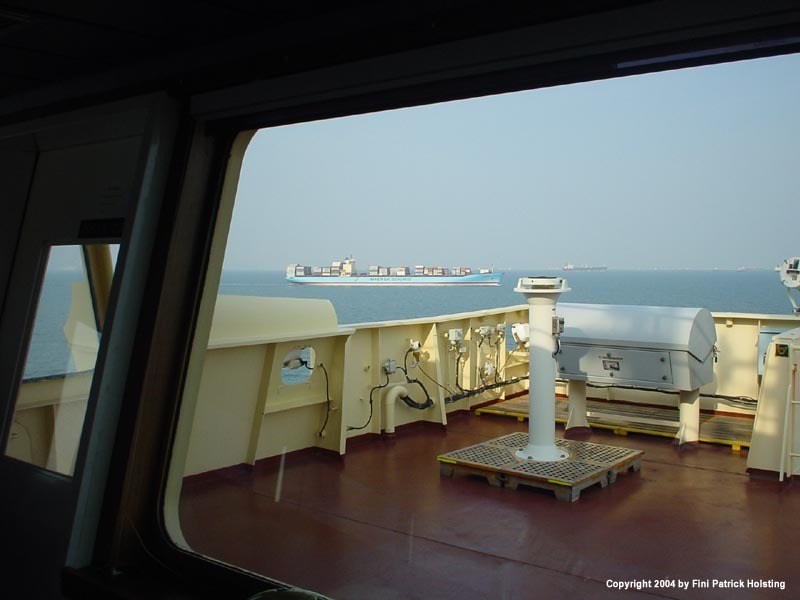 The Nicoline Maersk seen from the bridge of Nicolai Maersk. The little white "birdcage" on the railing is actually a meteorological station containing whet and dry thermometers. The north eastern coast of Australia close to Great Barrier Reef. 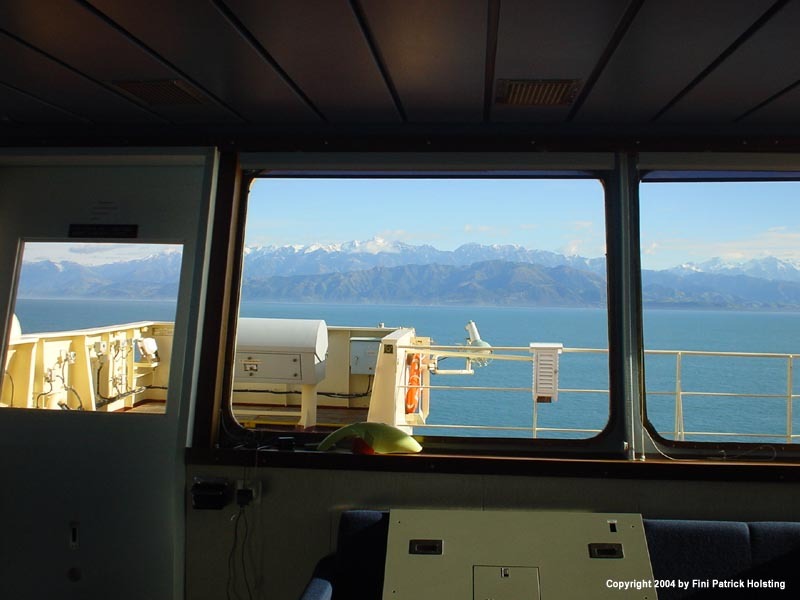 When transitting these waters, we always passed on the inside of the reef with a pilot on board. Passing the reef took nearly 24 hours. 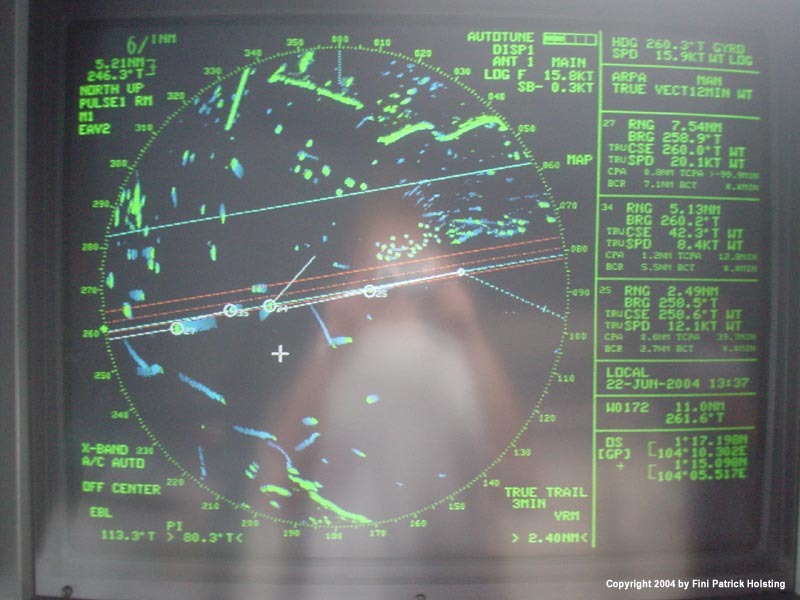 As we approach the always busy Singapore Strait traffic vastly increased, as seen on this radar image. Nearly all the green dots are other ships, and navigating these waters requires some concentration. 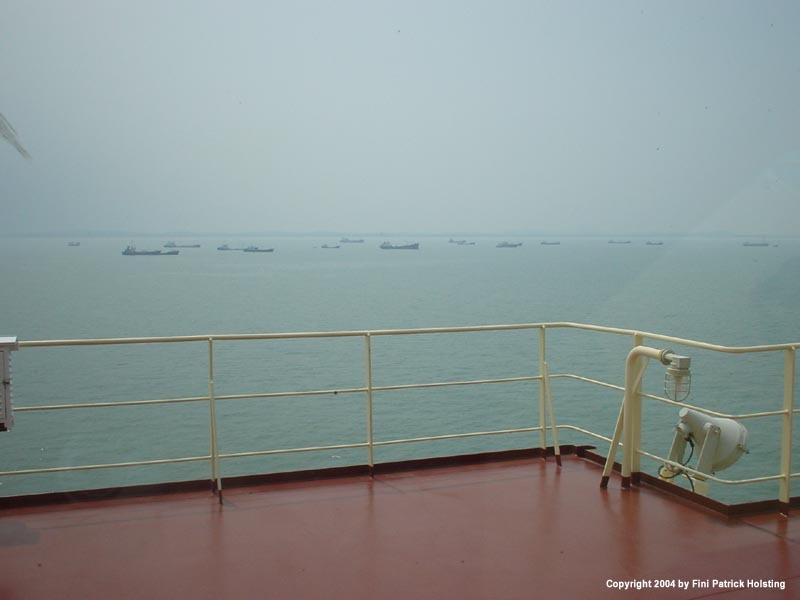 A large group of anchored ships in the Singapore Strait. Also, the usual fog or smog always engulfing these waters was beginning to thicken. 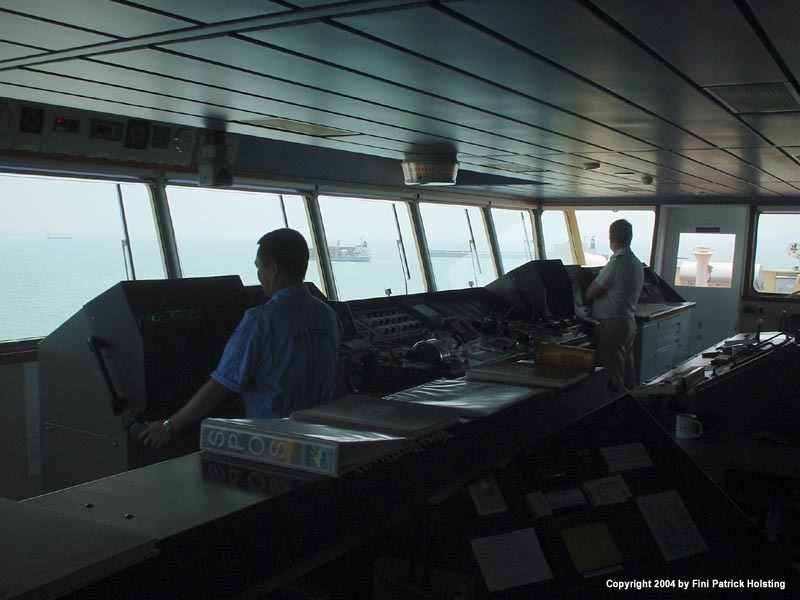 The Captain, having taken over the watch from the 2nd Officer, is navigating through still denser traffic as we approach Tanjung Pelepas. The 2nd Officer is keeping an eye on the multiple radar echoes. 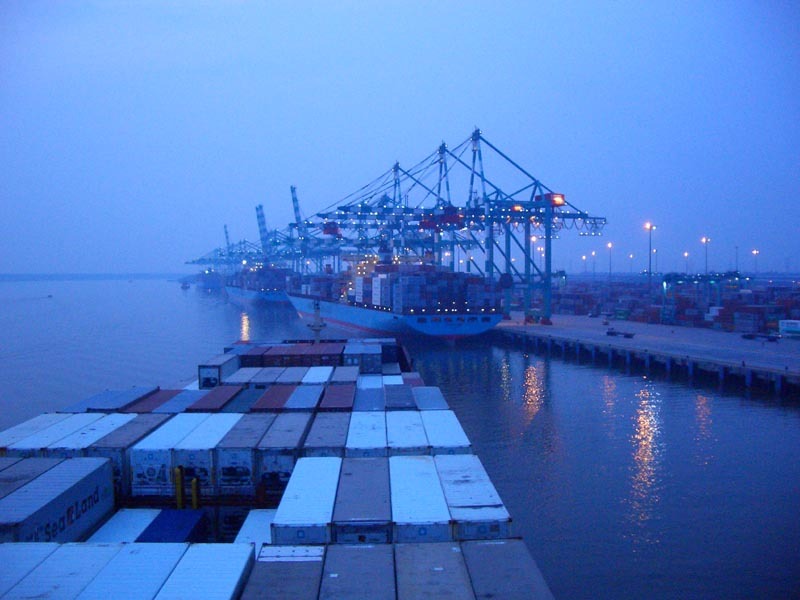 The Clifford Maersk on the way out from Tanjung Pelepas, Malaysia, as we were on the way in. Reaching a rain-soaked Tanjung Pelepas, Malaysia, exactly four weeks after our last visit here. All in all I did four round trips during my 16 weeks on board. 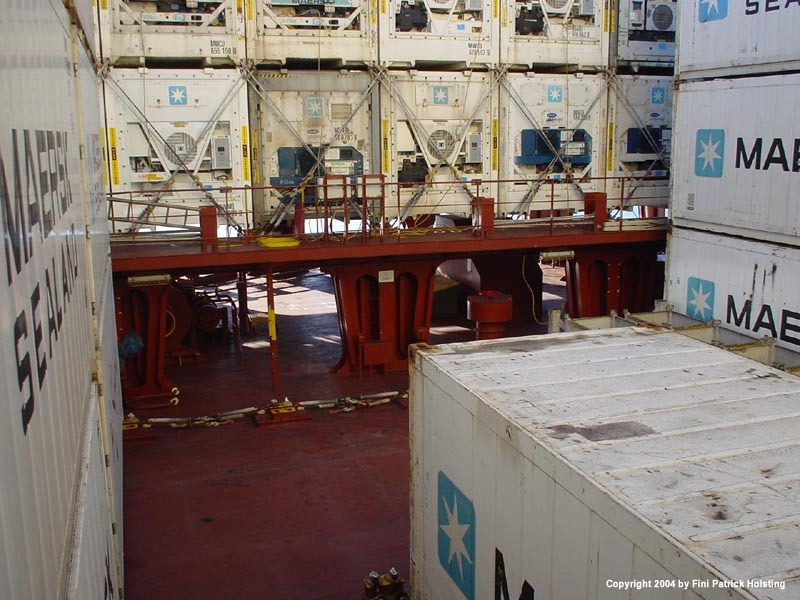 We berthed behind three other Maersk Line vessels. Overhauling a main engine exhaust valve and housing on the following southbound voyage. 3rd Engineer Danilo with his back to the camera. This is heavy equipment (the complete exhaust valve weighs around one ton), so the engine room crane comes in handy.